The Bible text about the bronze Laver is Exodus 30:18-21. 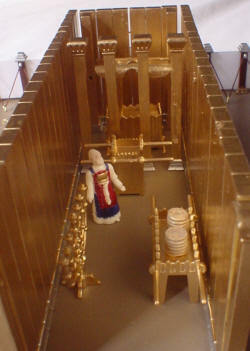 The bronze laver was where the priests washed their hands and feet before entering the tabernacle. God wanted the priests to be clean before entering His holy place. This may be symbolic to baptism and the washing away of sin today before entering the church. We envision the laver to be something like a modern bird bath today. 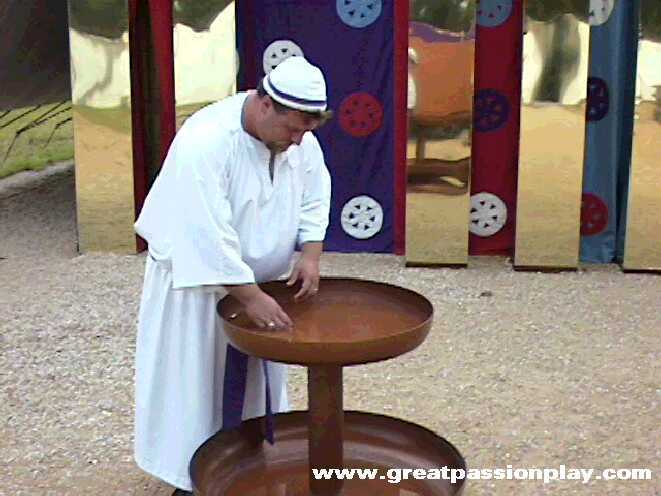 The folks at "The Great Passion Play" envisioned the alter to have two wash bowls, one at the top and one at the bottom. One for washing feet and one for washing hands. We rather envision the laver to be one bowl but set low for both feet and hands. 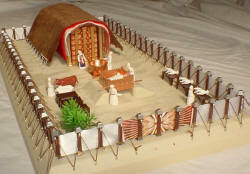 At left is a picture of the item as envisioned by the folks at "THE GREAT PASSION PLAY" who built a full scale model of the Tabernacle. This is NOT from our 3D model. You can use this image for comparison to the 3D concept. Here is Brent Kington's interpretation of the Laver. LAVER SKETCH: Brent Kington, the metal smith artist, favors a square based laver with a hammered out bowl in the center. 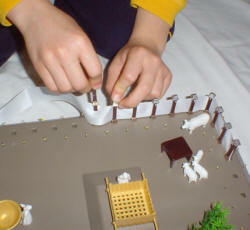 All the other furniture items were square and thus he expects the base of the Laver to be square also. He envisions the laver close to the ground. He has shown a way for the laver to be carried by poles similar to the other furniture articles although we do not know this for sure. Modern modelers seem to tend to favor round lavers. Brent has the following to say: "Speculation on the Tabernacle Laver unlike the Ark, Lamp and other implements to be made for the Tabernacle. Little direction is given for making the Laver (basin) - "Make in two parts, basin and stand, using the bronze from hand mirrors. No information is provided concerning design, size or ornamental details for making the Laver. 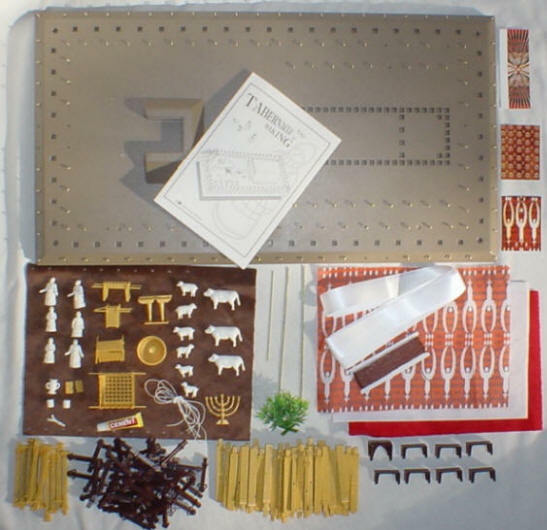 However, considerable detail is provided in 1Kings 7:25 for making the laver for the temple. Based on that information, as well as considerations of use, portability and ornamental detail required for the making of the Ark, Lamp and other Tabernacle objects, I have employed considerable artist license in this drawing of the Tabernacle Laver. The drawing is presented for discussion and debate." 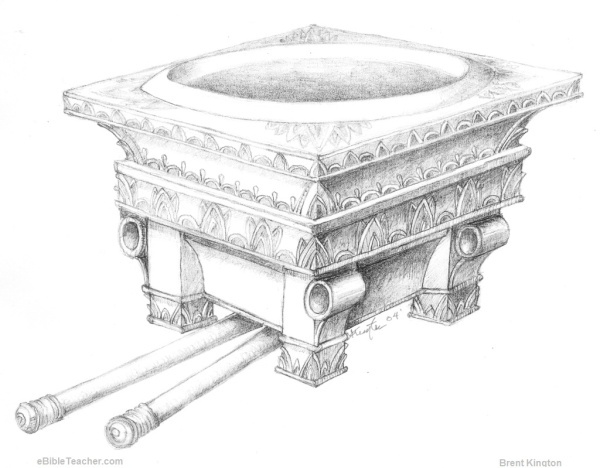 The bronze altar was made into two parts, a bowl and a base.